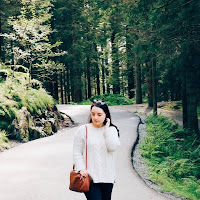 Christmas has just ended but I think we are all still in the christmassy mood of tiredness, cosiness and a constant food coma *the struggle is real, right* but I am coming to you today with a brand new post; it feels like ages since I just sat down and wrote a blog post but it's actually been just over a week or so. Christmas to me has become less magical over the years, it was always so incredibly exciting as a child but now...not so much, I've just bought a car vacuum in the sale. However, while it isn't nearly as magical at the grand old age of 24, there are still a lot of things I adore about the festive season including the christmas markets, constant movies, fairy lights (which I think should be mandatory all year round), festive decorations, gift giving and receiving and the food or should I say, the acceptability of being able to eat ALL THE FOOD. I'm a vegetarian, as is my grandad so christmas food isn't that exciting to either of us as traditional christmas food usually involves meat but there are treats that we both like such as warm chocolate cake with custard (which I definitely didn't eat for dinner yesterday), gingerbread biscuits, hot chocolate and mince pies. 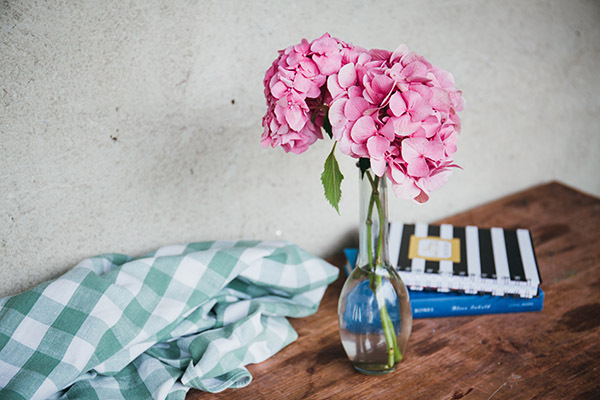 Rather annoyingly I have really quite sensitive teeth and some festive treats that include anything cold, such as ice cream or even just cold drinks will have me running to the kitchen to find something warm to reduce the pain. In comes Sensodyne to the rescue (cue angels singing) with their new *True White Mint Sensitive Toothpaste (£7.99, 75ml). 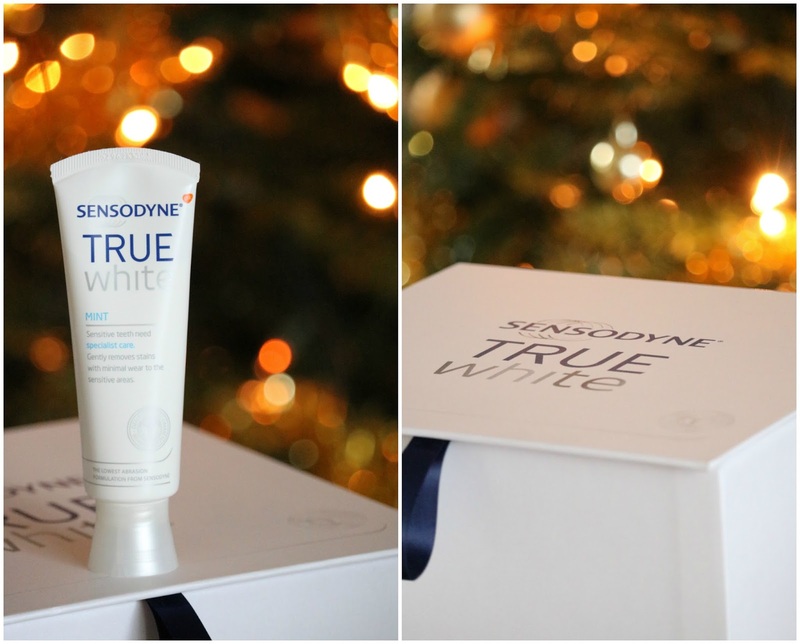 The new toothpaste is the lowest abrasion formula from Sensodyne (it's ten times less abrasive than other Sensodyne toothpastes) and is a specialist whitening toothpaste for sensitive teeth. Most people, myself included, want whiter teeth especially at this time of the year when you're meeting new people, visiting friends and family more and having Christmas/New Year parties to go to. I've tried a few whitening toothpastes and they don't seem to do that much for me personally and they can be so minty that it almost leaves a raw, burning feeling with my teeth and gums feeling even more sensitive than before but this new offering from Sensodyne is so incredibly gentle and it doesn't have a very minty taste either which is amazing for me! I've been using it for about a week now and I'm loving it; it's so much more pleasant to use compared to the Colgate one I was using previously which by comparison is just mouth burningly minty and harsh. I also love the packaging as it keeps the tube less messy. I haven't noticed a massive change in terms of the whiteness of my teeth but I definitely think it's starting to help and it's also helping a little with sensitivity even though I haven't been using it for very long at all. 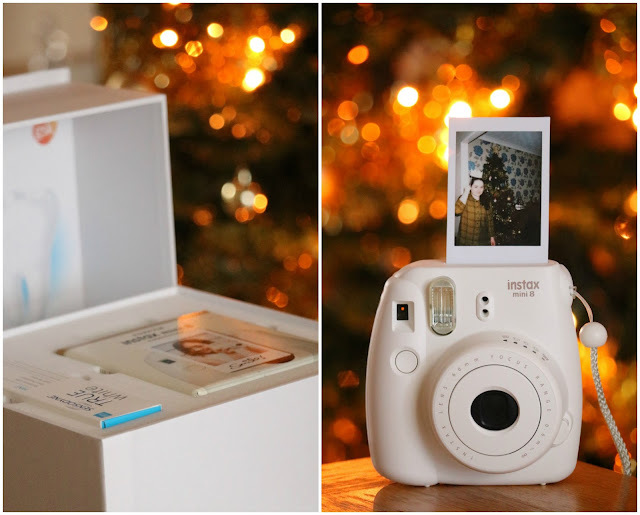 I was also very kindly sent an amazing Instax Mini 8 Camera and film from the super lovely and thoughtful people at Sensodyne as well as some christmas photo booth props which I did force everyone to wear on Christmas day! I adore the camera, I have wanted one for ages and I couldn't be happier with it! Highly recommend, as well as the toothpaste! Overall, I'm not only over the moon with the camera but I am so happy with the toothpaste as well and I really don't think I could go back to using another toothpaste as this one is not just really effective and so gentle but it isn't painfully minty either and with sustained use it will definitely continue to help with my teeth whitening needs and my sensitivity as well - what more could you ask for! Overall rating: ★★★★★, 5/5 (obviously). Have this tried this toothpaste or others from Sensodyne? Have you had a nice christmas? What do you think of the top tips? I have been wanting this camera for a while now. It is super cute!